It’s impossible to photograph anything here in natural daylight, as someone/thing has turned off the sun – we haven’t seen anything remotely bright in the sky for days now – and I’m getting moderately fed-up with it, arrrgh! Okay, rant over – ish. 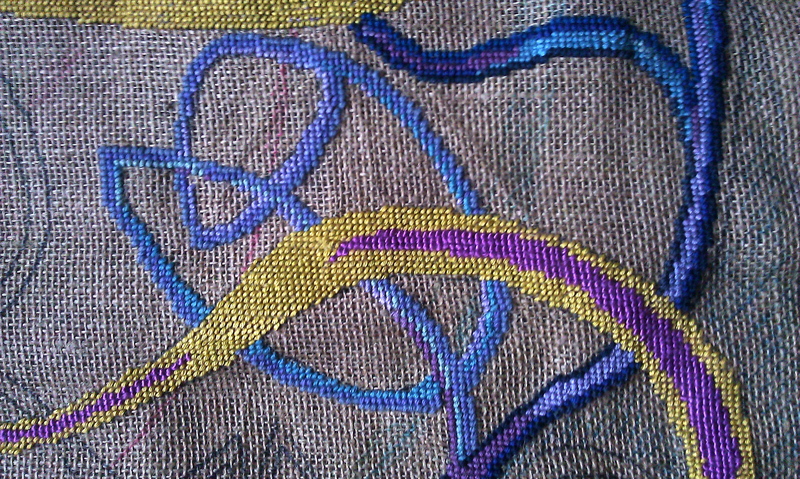 So anyway, (deep breath), moving on, just to say that there is some progress on the Celtic Swirl tapestry. 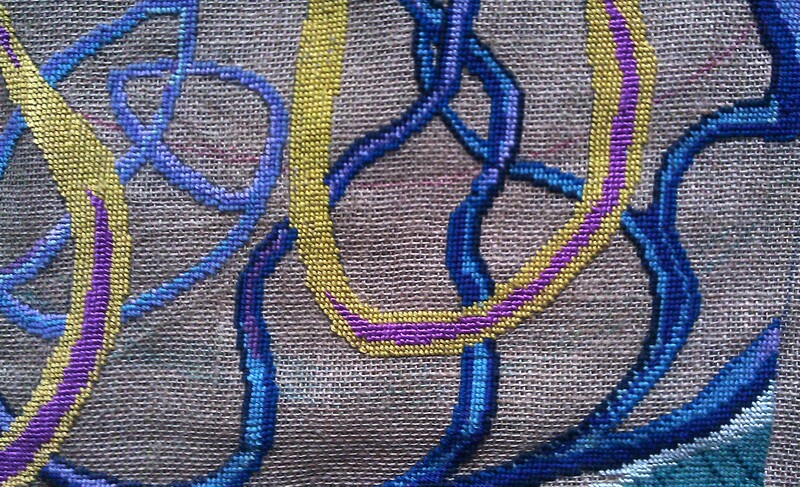 Having gone back to the hessian (burlap), for this one, I’m finding that although the stitches cover more quickly than in the last scrim piece, I’m having to stop and start a lot, moving the canvas around in my frame. I know it’s not the way it’s normally done, but I just don’t like the idea of having the design rolled away so I can’t see it as you would on a traditional frame – I need to be able to see the whole design as I’m working, so I use a large square clip-on plastic frame – great, but it slows me down a little. (I have considered making a much bigger frame, especially now that I have the floor stand, but I’m not convinced it would suit the ways I like to work, and would probably end up with a saggy middle – never a good thing!). I treated myself to a handful of balls of knitting cotton last week – mostly Rowan Cotton Glace. I needed to find something that stitches up with a sheen, but without having to buy hundreds of embroidery skeins. The best thing I ever found was Debbie Bliss Pure Silk, but my local retailer has stopped stocking it. I might have to trawl Webland to find some more. But I’m happy with the Rowan cotton – it stitches well and has a reasonable sheen, it also comes in the shades I wanted – something that’s not always easy to find. I never realised before I got heavily into needlepoint art, how much painters take for granted the ability to be able to go out and choose the colours they want off the shelf and then go home and mix up precisely what they want – we have to hope that we can find the shades we want, in a yarn that suits and at a price we can afford. 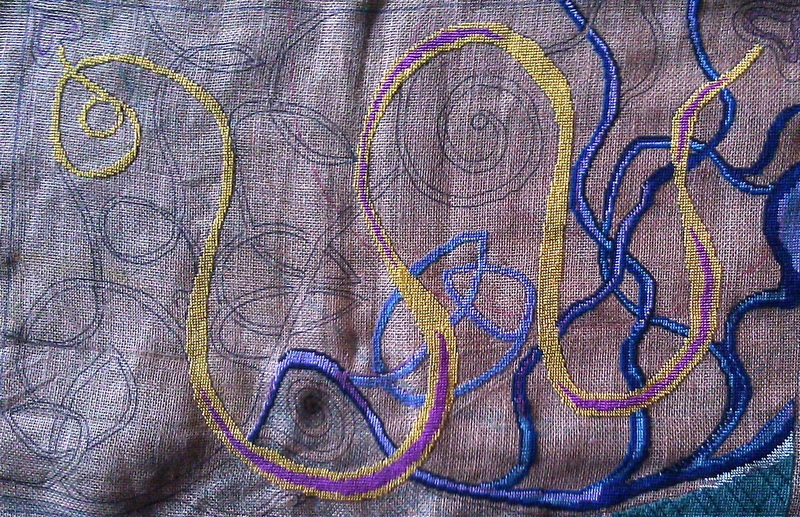 Anyway, the Celtic Swirl is definitely in progress – just don’t hold your breath.